I adore scones for breakfast in the morning. They are the perfect balance between cake and bread. I’ll admit, I first became addicted to scones when I was living in Scotland during college. There were so many bakeries and tea rooms that served scones with clotted cream morning, noon and night. 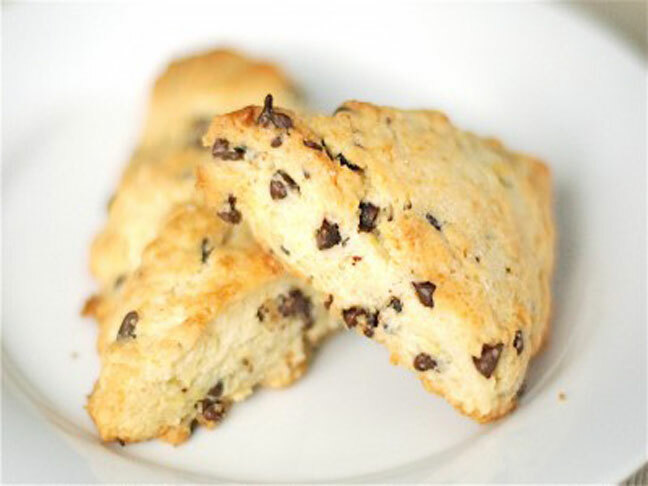 These mini Chocolate Chip scones are my favorite make-at-home scones these days. I often make the dough at night and bake them in the morning! 1. Preheat oven to 400ºF. Line a baking sheet with parchment paper or a silpat. 2. Sift flour, sugar, baking powder and baking soda into a bowl. Add orange zest and rub it together with some of the sugar between your forefingers to release the flavor. 3. Add the butter pieces and work it into the dry ingredients with your clean (!) hands or a pastry blender. Work until the mixture resemble small peas. Toss the cinnamon chips with a pinch of flour and then add to the butter mixture. 4. In a separate bowl whisk together egg yolk, heavy cream and vanilla. Pour in a steady stream into the butter mixture, stirring continuously until the dough becomes sticky and everything is incorporated. AT THIS POINT DOUGH CAN BE WRAPPED IN PLASTIC AND REFRIGERATED. 5. Press dough into a circle that is 1″ thick. Cut into wedges and place on baking sheet. Brush the tops of each scone with milk and scatter with raw sugar. As you can see above, I often cut them into some small pieces too – they are good for little hands! 6. Bake for 20 minutes, or until edges are golden brown.